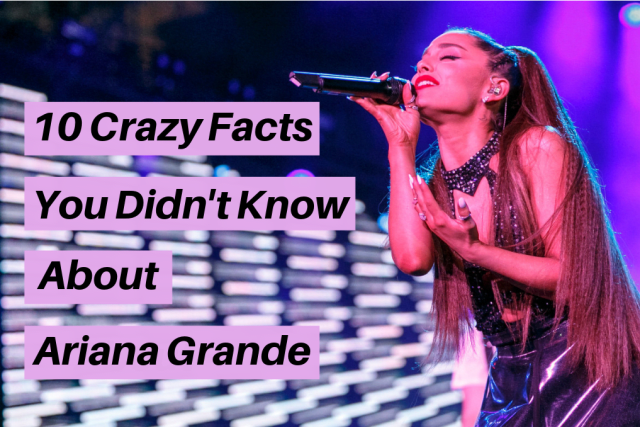 Here are ten things you NEVER knew about the pop princess. Click here for the first crazy fact! 2. She's one of those people who loves horror movies. 3. She has 8 dogs. 4. She didn't make it past auditions for her school choir. I bet they majorly regret that...Next! 5. She has a 4-octave range which is not common in singers. That's why she can hit all those high notes! Next. 6. She sincerely believes in demons. 7. She starred on Broadway in a musical called "13" when she was 13 before she became a pop singer. She started on Broadway, so you know she's legit. Next! 8. Her brother, Frankie was a guest on Ru Paul's Drag Race as well as Big Brother. I guess the entertainment biz runs in the family...Next! 9. She was sued for ripping off lyrics from a song from the 1970's. 10. She has a pet pig named "Piggy Smalls". She adopted the pig with then-finance Pete Davidson and swears that the pig is the "love of her life". Sorry Pete.